On 13 May 2016 a delegation of 30 ECCT members and staff led by Chairman Bernd Barkey and CEO Freddie Hoglund took a day-long excursion to the main island of Penghu. The trip was part of the ECCT's ongoing programme as a nationwide association to actively engage in cooperation with municipal governments all across Taiwan. The trip included a Premium Event lunch with Penghu Country Magistrate Chen Kuang-fu (equivalent of mayor) and senior Penghu County government officials, a guided tour of major tourist attractions and infrastructure projects including Penghu's desalination plant and wind turbines and a meeting between the ECCT's Low Carbon Initiative local government officials. In his speech Magistrate Chen spoke about his ambition to transform Penghu into a low carbon island. In this regard he welcomed the opportunity to cooperate with the ECCT, particularly the LCI. At the lunch a presentation on Penghu's history and major attractions was given by Dr Richard Hu, Professor in the Department of Marine Sports and Recreation at National Penghu University of Science and Technology.In the Q&A session, county officials explained that the Penghu government plans to increase the capacity of wind energy substantially and invest more in tourism facilities. A lot of projects will be opened for tender in the near future and ECCT members interested in bidding were provided contact details of the relevant officials.The government is also promoting Penghu as a cruise destination for regional cruise liners. A number of harbours currently restricted to military use will be opened up for civilian use in future. 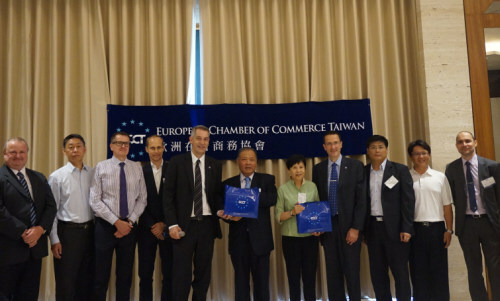 At the LCI meeting following the lunch, presentations were given by LCI Steering Committee representative Bart Linssen, German Institute Deputy Director Sabrina Schmidt-Koschella, James Chiao, Chairman & CEO of SmartCities Consulting and the Director-General of Taiwan Power Company (Taipower), Chen I-cheng. In his presentation Bart Linssen gave an introduction to the LCI and its activities. In her presentation Sabrina Schmidt-Koschella showed a video and provided an overview of a real low carbon island case study featuring the German island of Pellworm. Pellworm is a small North Frisian Island with a population of 1,200 mostly employed in the agricultural or tourism sectors. Pellworm produces three times more electricity than it consumes by using a combination of wind, solar and biogas. The surplus is exported to the mainland via two 20 kilovolt submarine cables. 80% of Pellworm's energy needs are covered by local renewables. Only fuel for cars needs to come from the mainland. In 2013, Pellworm started a smart-grid project, which uses smart meters installed in households to balance the energy volatility due to weather changes. Batteries provide electricity if there is neither wind nor sun. When storage systems are empty, the biogas power plant is used as a last resort. The presentation showed how the island's residents were initially skeptical of the benefits of going green but were eventually won over given the environmental and financial benefits of community-owned wind farms in terms of income generated and construction and maintenance jobs created for local citizens. Today, almost half of the population is actively involved in renewable energy projects. More than 75% of them are in favour of expanding power grids and the promotion of renewable energy. Local tax and rental revenues are reinvested in education, infrastructure and culture. In addition, Pellworm is actually attracting tourists curious about the island's energy concept. Since the island is very similar to Penghu in many ways, it offers an excellent model for Penghu's future development. In his presentation James Chiao gave an introduction to Penghu's smart island strategic plans which covers telecommunications and transportation (including electric scooters and buses). In his presentation Chen I-cheng gave an overview of Taipower's wind energy plans and goals for Penghu, which is one of the state-run power company's major target areas for developing wind energy. Taipower is now in the process of procuring equipment and ships to be used for constructing observation towers and foundations and eventually for installing turbines. Following the LCI meeting, delegates were taken on a tour of Penghu's desalination plant and a visit to wind turbines. The trip ended with a visit to a white sand beach and coffee while watching the sunset.